Life is filled with so many complicated things, there's no reason why coffee creamer should be one of them. Really, it's one of the simplest things to make. Yet I've seen many recipes for homemade vanilla coffee creamer on Pinterest that require the milk to be heated to just the right temperature to dissolve the sugar, and then cooled quickly enough to protect its integrity. They're filled with a mass of unwholesome ingredients like sweetened condensed milk, and most are severely lacking in the vanilla department. My recipe starts with organic half and half and pure vanilla. It needs no heating; therefore insuring that the cream stays as fresh as possible. 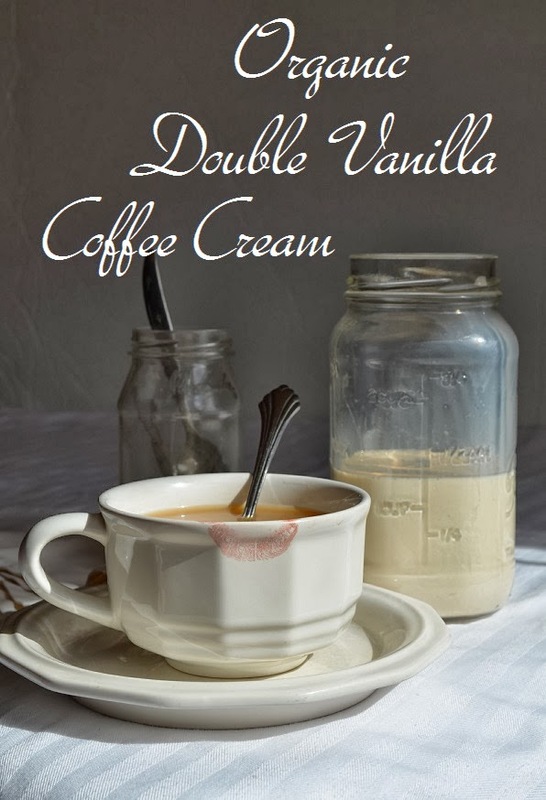 Quite frankly, this organic double vanilla creamer is the crème de la crème of coffee creamers. Most mornings I prefer my coffee unsweetened. Just a splash of half and half is all that's needed, and the store-bought vanilla creamer is nauseatingly too sweet. However, there are mornings, specifically when I toast my son's waffles and the kitchen fills with the aroma of sweet vanilla, that I long for a vanilla coffee. 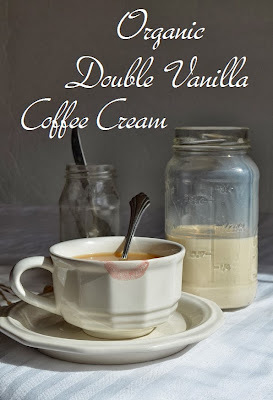 A jar of this creamer can be mixed up in just the few minutes it takes for my coffee to brew. It's sweetened with unrefined, organic agave nectar which, unlike sugar, will dissolve easily in the cold cream. No need for heating. I don't like it too sweet, but you can add as much agave nectar as you like. And of course, it's packed with an intense dose of heady vanilla. 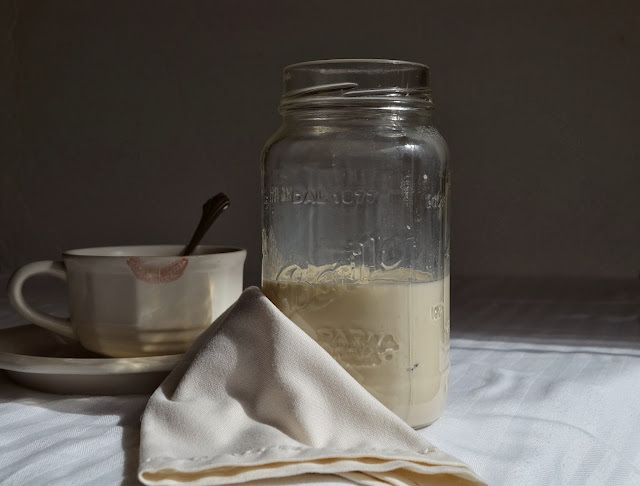 To double the flavour, I swipe a left-over vanilla pod from my jar of vanilla sugar and let it infuse the cream. (For more on vanilla sugar, see the kitchen note below.) The tiny vanilla beans float like flower petals on the smooth surface of the cream - bold and supremely rich. The longer it sits, the stronger the flavor becomes. A word of warning: don't be tempted to try this creamer straight because you just might drink the whole jarful! This is coffee creamer, made as simple as possible. When you use the very best ingredients, nothing needs to be complicated. *kitchen note: Vanilla Sugar - I keep a jar of sugar in my pantry. Whenever I scrap the beans from a vanilla pod, I place the empty pod into the sugar to infuse. Use the vanilla sugar to sweeten whiped cream, sprinkle on toast, in tea, over oatmeal, or in anything else that needs a touch of sweet vanilla. The leftover pods can then be removed from the sugar to infuse this cream. Always looking for good and healthy creamers to go with coffee!